You’re always organized when it comes to your business’s payroll, expenses for office supplies, and the cost of manufacturing the goods you create for customers. But one expense that you don’t feel like you have a good handle on? You know that you’re paying too much, but you’re not sure if shipping cheaply — and efficiently — is truly possible. It’s much easier to lower your shipping costs than you might think. This post is here to help you learn how to make it happen. Keep on reading to start saving on shipping and improve your overall shipping process as a result. One of the most effective ways to lower your shipping costs? Consider working with regional carriers as opposed to “big box” shipping companies. Often, they’ll provide the same services as their well-known competitors at a fraction of the cost. Plus, you’ll likely get a much higher level of personal attention and service. Couriers are also an excellent option when it comes to your final mile delivery options. Not only are they able to get things at their destination quickly. They’ll also provide you and your customers with shipping and tracking updates every step of the way. Many companies love the fact that they’re able to get discounts for shipping with a singular supplier. But are those discounts really saving you all that much money in the end? Especially if you ship to international locations or have customers across the country, the cost of getting things too and from fulfillment centers and drop-off locations may be too high. Consider working with multiple carriers in different regions to save. Plus, you’ll also instigate a bit of competition between the different shipping companies you’re using. Make sure you always read reviews of these carriers and any shipping boxes they offer before you decide to work with them. You want to be certain you’re getting the highest level of service and attention possible. 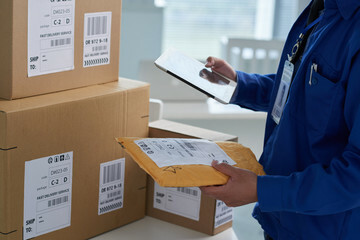 Many people get so caught up in how they can find the cheapest shipping rates, that they overlook one of the biggest money pits when it comes to shipment costs: the packaging itself. Ship multiple items in a single order when possible. Buy packaging in bulk from a discount supplier. Check with your shipping companies first to ensure you won’t be hit with “dimensional fees” for using packaging not provided by the shipping company. Reward customers who mail used packaging back to you or drop it off at a select location with discounts off future orders. In addition to helping you to save on the costs of your packaging, going with a recyclable and smaller option will also help you to lower your environmental impact. Shipping cheaply also means being hyper-aware of any fees that your current shipping providers are trying to hide from you. Make sure that you know the exact cost of things like for weekend or after-hours delivery. The same goes for things like charges for fuel, delivery signatures and tracking services, and much more. If you feel like you’re getting charged extra for things that really should be standard — like delivering to residential addresses and email notifications about shipments — it’s time to move on. In addition to taking a closer look at the fees your shipping company is charging you, also evaluate the shipping fees you’re charging customers. About 61% of customers say they’re happy to pay a bit more if it means getting same-day shipping. Providing this service often comes at a high cost to you as the retailer, so don’t be afraid to charge more for your immediacy. It’s also important to factor in the weight and dimensions of your items when determining their shipping costs. You don’t want to end up eating charges that your customers really should be paying for. Just make sure you have a transparent shipping cost calculator in place on your website so that customers understand why they’re being charged more. One of the most important ways that you can make shipping cheaply happen is also one of the easiest tactics to take. Remember that you have far more negotiating power than you might realize when it comes to small business shipping options. Take your initial personalized shipping quote for LTL as a starting point, and not a final offer. Especially if you work with more than one shipping company, don’t be afraid to let them know you’re getting a better rate than they can offer with someone else. You should also ask for loyalty discounts. Shipping companies will often offer discounts to clients that ship items in bulk with them. Check out this post on how to negotiate with your suppliers to make sure you get the best possible prices. From working with multiple carriers to rethinking your fees and packaging options, shipping cheaply isn’t as hard as it might initially seem. Of course, we understand that your shipping process isn’t the only place where you’re looking to cut costs. You need to know how to save on your raw materials, your website hosting services, your marketing strategy, and anything else you can. You also want to be certain you’re running your business as efficiently as is possible. We’re here to help make that happen. Keep checking back with us for more invaluable tips and tricks about how to stretch and make the most of every last dollar your business brings in.